Plan & Go | Hiking Photography is the essential handbook for anyone eager to hone their creative vision and take more compelling photographs in the field. Whether it is a spontaneous day hike on a local trail or a well-planned backpacking trip through remote wilderness, we all want to document our favorite outdoor experiences, either for personal memories or to share them with others. Capturing striking images in varying terrain and quickly changing conditions, however, requires sound knowledge and careful preparation, especially when gear choices are limited. Plan & Go | Hiking Photography is the essential handbook for anyone eager to hone their creative vision and take more compelling photographs in the field. Follow basic principles to compose and shoot striking outdoor images on the go. Choose the right equipment based on your photography goals and trip requirements. Turn off “auto everything” mode and determine the best settings for every condition and subject yourself. Fix minor imperfections in your photographs and enhance them creatively. Organize your digital files at home and share them with family and friends. Alison Newberry & Matt Sparapani have perfected their hiking photography on hundreds of trail miles across the globe. 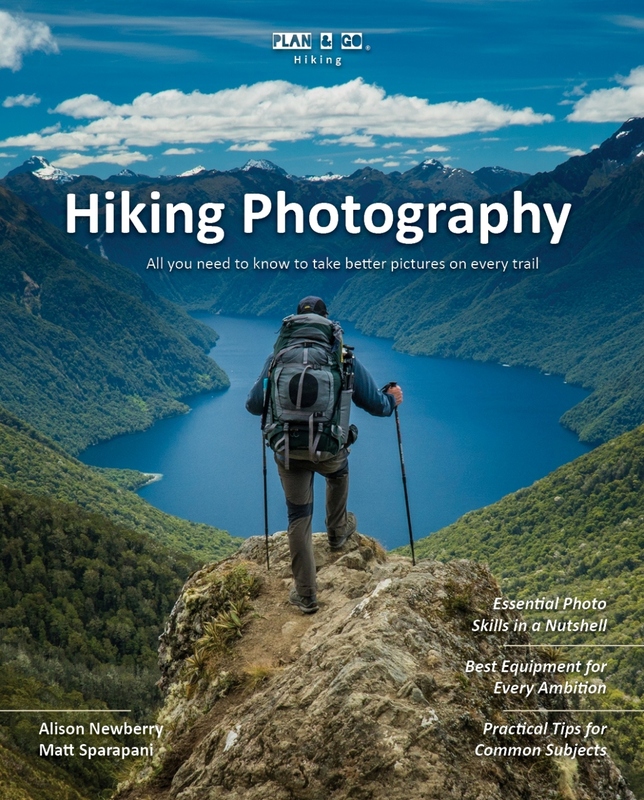 In Plan & Go | Hiking Photography, they share best practices and lessons learned to help you get better results with your smartphone, compact, action, mirrorless, and DSLR camera. Join them on a photographic journey to the world’s most beautiful hiking destinations and find additional inspiration for your own travel and photography ambitions. Matt Sparapani and Alison Newberry discovered their enthusiasm for travel while living in Italy after college. As newlyweds they developed a mutual love of nature photography and have since combined this passion with international travel and a variety of outdoor activities. From trekking in Nepal to safari in Africa, from backpacking in Patagonia to canoeing in the Boundary Waters, the camera has served as a constant reminder to pause and savor the subtle beauty of nature. Alison and Matt began their backpacking lives in Chile with a thru-hike of the “W” in Patagonia’s Torres del Paine National Park. Since then, their backpacking and trekking adventures have included Mount Fitz Roy in Argentina, the Annapurna Circuit in Nepal, the Inca Trail to Machu Picchu, the summits of Meru and Kilimanjaro in Tanzania, the Laugavegur Trail in Iceland, the Himalayas in northern India, the Wonderland Trail around Mount Rainier, and the Cordillera Blanca and Huayhuash ranges of Peru. In 2016, they completed the 210-mile John Muir Trail in the Sierra Nevada of California and New Zealand’s Routeburn, Kepler, and Rakiura Tracks. While not on the road, Matt and Alison reside in Chicago, Illinois.